Shoulder impingement syndrome is a common condition affecting the shoulder and is often seen in aging adults. This condition is closely related to shoulder bursitis and rotator cuff tendintis. These conditions may occur alone or in combination. When an injury occurs to the rotator cuff muscles, they respond by swelling. However, because the rotator cuff muscles are surrounded by bone, when they swell a series of other events occur. The pressure within the muscles increases, which results in compression and loss of blood flow in the small blood vessels. When the blood flow decreases, the muscle tissue begins to fray like a rope. Motions such as reaching up behind the back or overhead to put on a coat or blouse, for example, may cause pain. Symptoms of shoulder impingement syndrome include difficulty reaching up behind the back, pain with overhead use of the arm and weakness of shoulder muscles. If these muscles are injured for a long period, the muscle can actually tear in two, resulting in a rotator cuff tear. This causes significant weakness and may make it difficult for a person to elevate the arm. 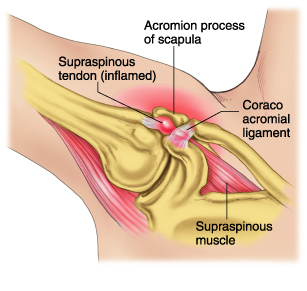 Some people may even rupture the biceps muscle as part of this continuing impingement process. Diagnosis of impingement syndrome begins with a medical history and physical exam by a qualified doctor. X-rays may be taken to rule out arthritis and may show changes in the bone that indicate injury of the muscle. Bone spurs or changes in the normal contour of the bone may be present. Impingement syndrome may be confirmed when an injection of a small amount of an anesthetic into the space under one of the shoulder bones relieves pain. Oral anti-inflammatory medications such as aspirin, naproxen, or ibuprofen, remain the most common treatment for impingement syndrome. These will need to be taken consistently for nearly eight weeks to be effective. Taking anti-inflammatory drugs for a short period of time may treat the symptom of pain, but it will not treat the underlying problem and symptoms will return. There is no specific medication for this condition and response to any given medication differs from person to person. If one anti-inflammatory medication does not help within 10 to 14 days, then another one can be given until one that provides relief is found. In addition to taking medications, daily stretching in a warm shower will help. You should gently work to reach your thumb up and behind your back. Avoid repetitive activities with the injured arm, particularly activities where the elbow would move above shoulder level. Avoid repetitive motions such as vacuuming, painting, raking leaves and washing the car. Your doctor may refer you to a physical therapist who can demonstrate the exercises most effective in strengthening and stretching the shoulder muscles. Platelet rich plasma (PRP) and stem cell therapy are innovative and cutting–edge treatment techniques which could help to repair chronic or acutely damaged muscle, cartilage or joint problems, and help with the healing process. Platelet Rich Plasma (PRP) therapy captures the healing growth factors that are in a person’s own blood. By injecting the PRP into the damaged area, it could help regenerate muscle and tendons, and diminish pain. In addition, there are indications for platelet rich plasma in healing a variety of conditions, in much the same way that stem cells can be used to help regenerate different types of tissues. Adult stem cells can also be used since it contains many of the healing growth factors that are also found in platelet rich plasma. If you continue to suffer with shoulder impingement syndrome and your current treatment plan leaves you wanting more options, perhaps a fresh set of experienced eyes can change your outlook. Since 1990, Dennis M. Lox, M.D has applied his personal interests in sports medicine, cutting-edge regenerative medicine and chronic pain management to helping patients increase their quality of life. Contact us for an appointment at 727-462-5582.